Summer will be here soon, and a nice cold glass of Fresh Ginger Lemonade is a great way to cool off! Disclosure: This Fresh Ginger Lemonade post was sponsored by Boscov’s, but the recipe and opinions are entirely my own. Thank you for supporting the brands that support Spiced! What the heck, Old Man Winter? It seems like Winter just wants to hang on as long as possible this year. I mean we’re in mid-April, and we had freezing rain here this past weekend. And the forecast is for 2″ of slushy snow tonight. Laura’s parents were in town over the weekend, and we awoke on Sunday to find a nice, thick layer of ice on their car. Fun activities like that are normally reserved for February…not mid-April. Despite the weather, we still had a blast this past weekend. Robbie loved all of the attention, and he was literally a wild man running around the house. At one point, I walked into the kitchen only to be nearly run over by a parade that came marching by. (By parade, I mean Robbie leading my father-in-law in a march…with both of them holding as many stuffed animals as they possibly could.) However, there’s only so much you can do indoors, so we decided to venture out to mix up the activities a bit. But back to the VIP Days event. This was awesome! I pulled into the parking lot a few minutes after the doors opened, and it was already packed. The store literally felt like a party as soon as I walked in. 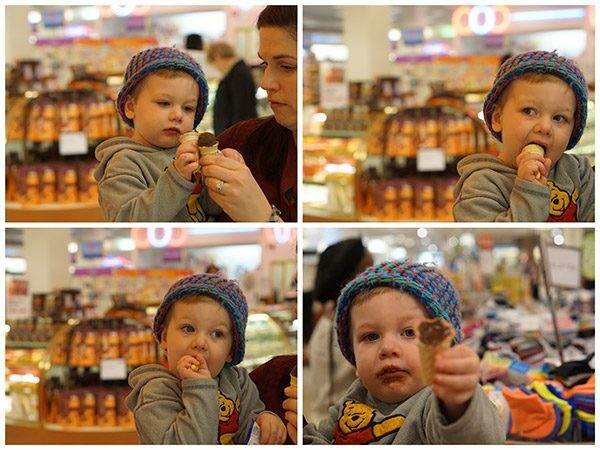 While Robbie loved all of the activity, his first stop was the waffle station…imagine that! He also managed to score some Legos, a piece of Godiva chocolate and a bouncy ball that lights up when it hits the floor. From a toddler’s perspective, that’s pretty much the best day ever! (Heck, from an adult’s perspective, that’s pretty much the best day ever!) 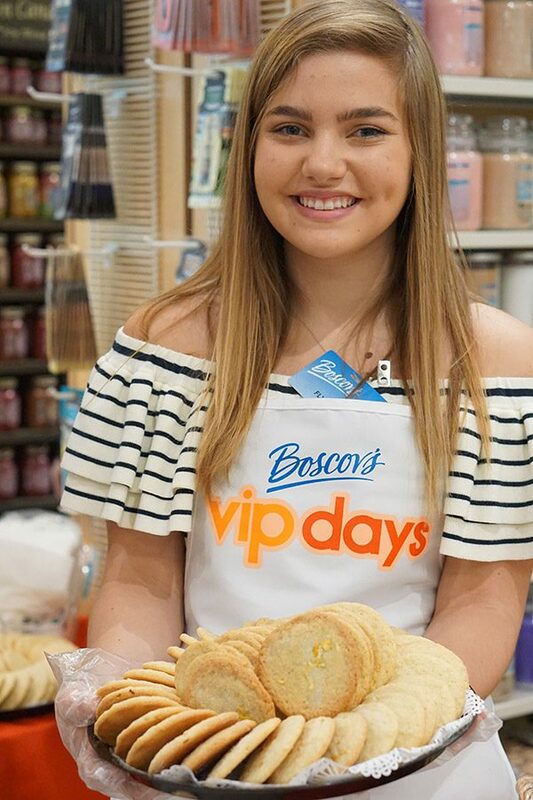 While the VIP Days event was only last Saturday, Boscov’s has great deals and sales all year long. Somehow, in the midst of chasing Robbie around the store, Laura and I managed to squeeze some shopping in for ourselves. I grabbed an awesome triple drink dispenser that will be perfect for backyard parties…if the weather ever shapes up! And Laura found an essential oil diffuser by HoMedics that she picked up for her office. One of her coworkers has an essential oil diffuser in her office, and Laura loved the idea. Busy workdays can get stressful, so having a diffuser running on the side of your desk helps create a peaceful environment. Laura even inspired me, and I grabbed a Himalayan Salt Lamp for my desk here at home. Plus, it just seems appropriate for a food blogger to have a salt lamp on the desk, right? 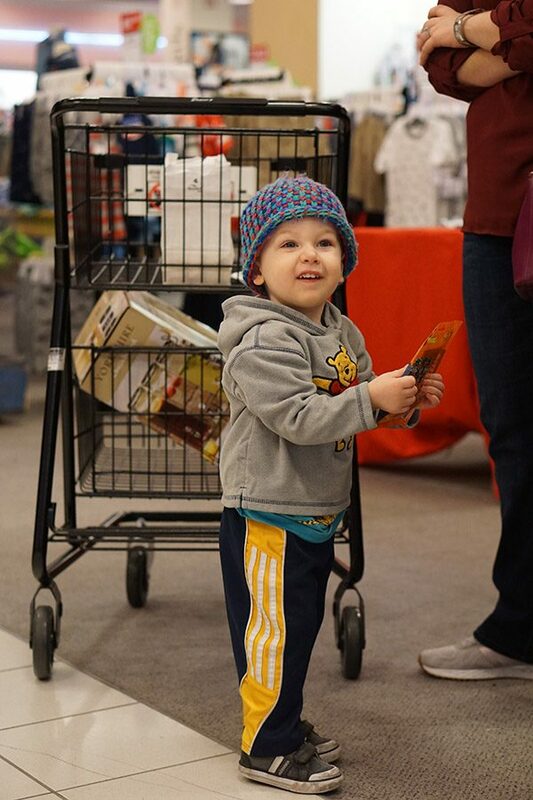 All in all, the entire family (including Robbie) had a great morning at Boscov’s! In fact, my father-in-law was still talking about meeting Jim Boscov later that day. Even though the weather wasn’t the best, I wanted to put my new triple drink dispenser to use right away. Laura suggested that I make Fresh Ginger Lemonade, and that sounded like a fun idea. Maybe the fresh ginger lemonade idea will help will the warmer weather to arrive? That’s my plan at least! And since I had 3 drink dispensers, I made iced tea (sweetened of course…I am from the South) in the 2nd dispenser and then an Arnold Palmer in the 3rd dispenser. Have you ever had an Arnold Palmer? 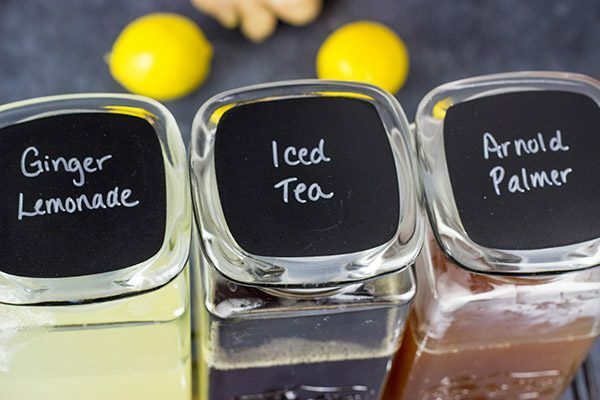 It’s half-lemonade, half-iced tea…and it’s delicious! Every time I step foot into Boscov’s, I come out with some awesome new finds at great prices. But aside from the deals, I appreciate that Boscov’s is very active in our local community. Throughout the Spring, they always host Girl Scout Cookie sales, and Boscov’s regularly supports all sorts of non-profit events in our town. I certainly appreciate that! After we got back home last Saturday (and after Robbie had a nice, long nap), we all sat around sipping on glasses of Fresh Ginger Lemonade. 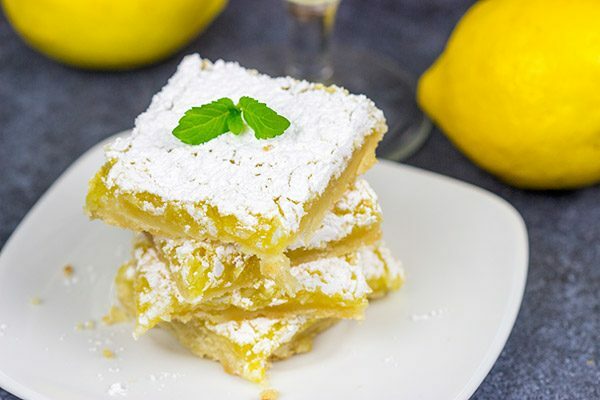 And I made a quick batch of my Lemon Coconut Bars as a sweet treat along with our lemonade. Hopefully we’ll be able to move that party outdoors soon! Let’s raise a glass of fresh ginger lemonade to the arrival of warmer weather…hopefully soon! Cheers, friends! Using a large saucepan or stockpot, add water, sugar and ginger; stir and place over medium-high heat. Heat until mixture reaches a boil, stirring occasionally. 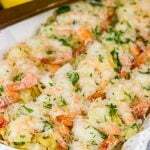 Once boiling, remove from heat and stir in lemon juice. Let mixture rest for 30 minutes and then strain out sliced ginger. Refrigerate lemonade for 1-2 hours, or until cold. Serve over ice and (optional) garnish with sliced lemons and sprigs of fresh mint. First, Robbie is too cute for words! I love his smile in the pic with the bouncy ball :). Second, how have I never heard of Boscov’s? 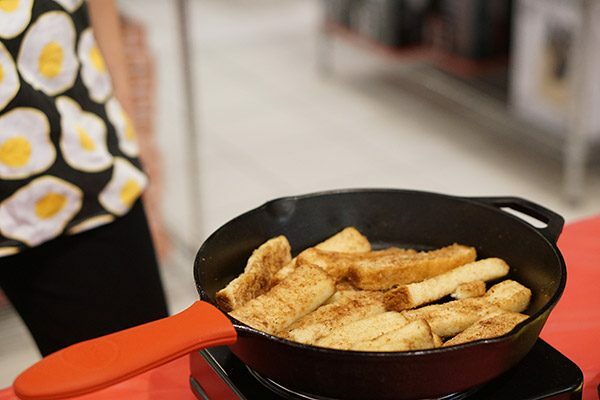 I just took a quick peek at their site and found like five things I need–pineapple cakelet pan? Necessary! Third, this lemonade sounds PERFECT for hot Phoenix days! And last, I’m bottling up some sunshine to send to you guys. You need it more than we do out here! David!! Robbie is getting cuter by the hour!! my gosh! So glad to see him growing up! it’s so nice to feel as part of your life and see you doing just fine! I’m glad you shared this post! Hugs my friend! Robbie really is a cute kid, Gaila! I haven’t included any photos of him in a bit. That wasn’t on purpose, but these photos from the event on Saturday were just so good! I think I need to frame the one with him and the ball. 🙂 Thanks so much, my friend! 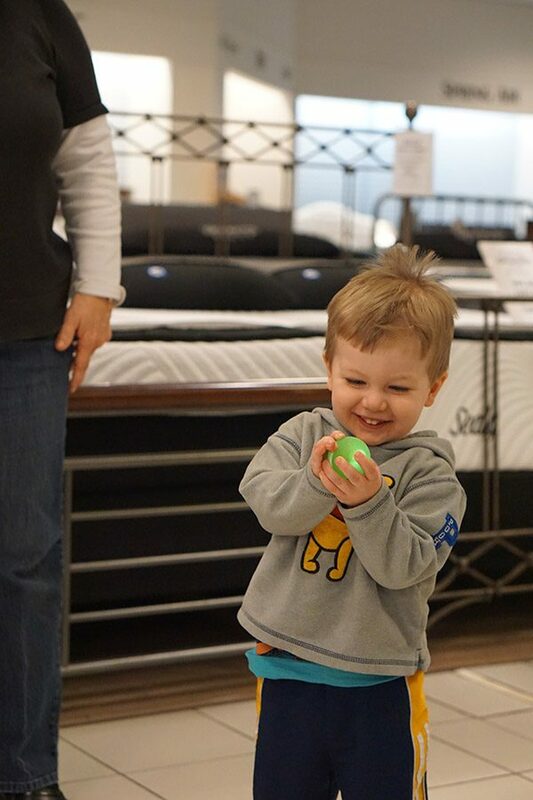 Love the picture of Robbie with his new bouncy ball – that is pure happiness, he has the most gorgeous smile! Sounds like you had an amazing time at Boscov’s and I like how you made immediate use of your drink dispensers. Hope you’ll be able to bring it outdoors soon. Never had an Arnold Pal- like the concept! Have a wonderful weekend ahead, David! Oh, you are totally right, Miriam. Robbie was over-the-moon excited about that new ball. In fact, he’s been playing with it here at home all week…and he still gets just as excited about it! I’m hoping the weather warms up here, too. The forecast is looking promising, so I’ve got my fingers crossed! And, yes, go make an Arnold Palmer sometime soon. 1/2 lemonade. 1/2 iced tea. 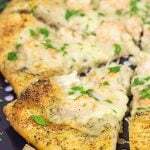 Really tasty! Thanks so much, my friend! David, posting the recipe for refreshing lemonade…I love your sarcasm! Well, remember I was bragging about our nice spring weather few weeks back? You don’t need to be jealous anymore 🙂 On the other hand, let’s think (hope) this lemonade is some that might persuade spring into coming ans staying with us. You should definitely pull your grill too! David I reckon that you and I could probably have a continual running commentary together on how the weather has gone completely loopy. Winter is now spring, spring is now winter and it’s all gone back to front / head over heals hasn’t it? Like yourself I’m creating recipes that maybe aren’t appropriate for the current weather, but it SHOULD be time for drinking fresh ginger lemonade outside shouldn’t it? And I would also like to be eating those Lemon Coconut Bars too! 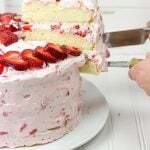 Let’s hope for better weather, but in the meantime still enjoy these amazing recipes. Oh gosh, you are totally right, Neil. I feel like the weather (both here in the Northeast as well as over there in Glasgow) is just playing tricks with us. We’ve been running 20°F below average for like a month now. I’m done with it! I’m hoping that this fresh lemonade recipe helps usher in the warmer Spring weather. (It might be working, too, as the forecast for next week is finally back up to ‘normal’ weather for this time of the year…whatever ‘normal’ is. Haha!) Thanks so much, my friend! I wish we had a Boscov’s near us! That’s my kind of shopping. 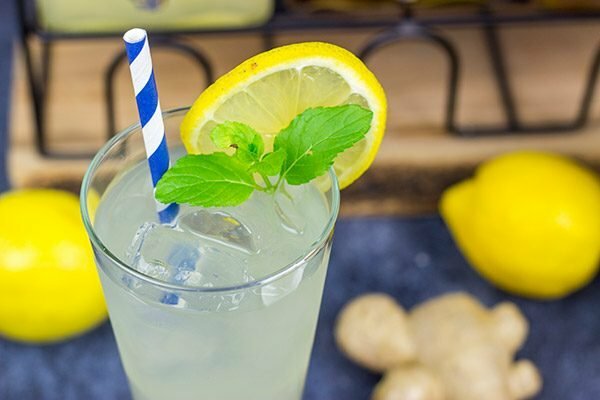 This ginger lemonade sounds super refreshing – especially on a hot day! I’m certain it will indeed become hot, one day, and then we will be wishing for cooler weather! I’ll be ready with a huge vat of this lemonade! I totally agree with you about Boscov’s, Kathy! And I really do wish they had a location near you. Every time I go in, I find some new piece of cookware or serveware that I absolutely must have! 🙂 So hot days are coming…maybe. Haha! And when they do, this ginger lemonade needs to be on the menu! Trust me on this one. The ginger adds a fun depth of flavor here…and it’s so tasty! Thank you, my friend! It really is crazy how quickly Robbie is growing up. I look at him and wonder where my little boy went! It’s ok, though. He does some hilarious things, and the joy he had about that bouncy ball was the best! In other news, this ginger lemonade is really, really, really good. The extra layer of flavor takes lemonade to a whole new level! Thanks so much, Dawn! That was such fun to read!! Now I’m so sorry I didn’t get to officially meet Robbie. He looks like he had a blast, and Scarlet would have loved to hang with him. I’m so impressed with the Ginger Lemonade. Cassidy always thinks I don’t like ginger, but I really, really do! And lemonade is my summer drink. 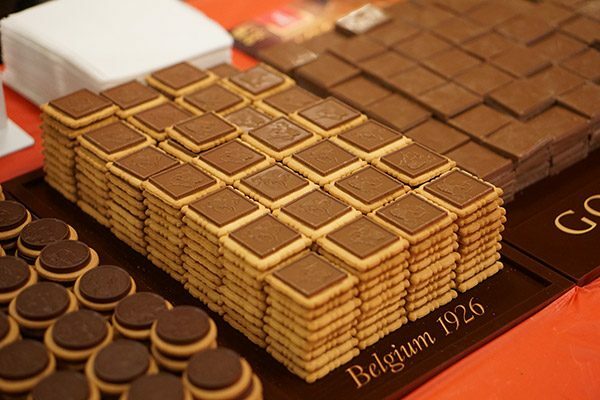 I bought those Godiva biscuits pictured above and they didn’t last a full day here! Well it looks like we’ll just have to plan another meeting at Boscov’s, Tamara! I’m sure I can twist your arm, right? 🙂 So those Godiva biscuits were SO good. I didn’t grab any, but we’re lucky enough to have a Boscov’s about 5 minutes from here, so I might have to swing back through this weekend. 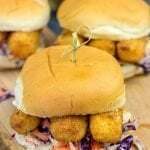 I bet they’d go great with some ginger lemonade! Thanks so much, Tamara, and I hope our paths cross again soon! Robbie is adorable! so Cute!! This lemonade sounds so refreshing, we are having a nice warm day here today so this sound just about perfect! Will you send us some of that warm weather, Manali? Haha! Actually, I think that weather is supposed to arrive here sometime next week…so I’ll have to make another batch of this lemonade so I can sit outside and soak in some sunshine! 🙂 Thanks so much! YAY! I’m happy to hear you got your meat slicer!! And holy cow is your son freaking adorable. You and your wife should get a “made the most adorable child award” or something (they have awards for that kind of thing, right?). 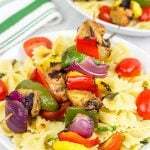 I can’t begin to tell you how much this recipe is right up my alley! Fresh ginger and I are besties. We barely go a couple days without seeing each other. I made candied ginger in December and still have the leftover ginger syrup in my fridge. I’m going to go smell/taste it b/c if it’s still good, I’m adding the lemon juice and going to town on it! Haha! Is there such a thing as an award for ‘most adorable child’? I mean Robbie is pretty cute, but that award comes with a pretty high bar! 🙂 So I’ve got to say this Ginger Lemonade is da bomb, Christina! Seriously. Adding the ginger to steep in the lemonade adds another layer of flavor here…and it’s so good! And then mix that ginger lemonade with iced tea? Perfect summer drink right there. I bet you could totally use that ginger syrup that you have stashed away to make a lemonade. And I bet it won’t last long! Thank you so much, my friend! I happen to have ginger and lemons on hand. So I’m making this. How does Laura like the diffuser? I’m thinking of getting one. 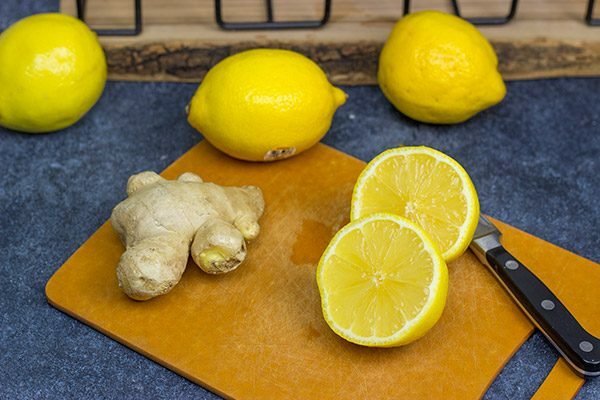 We often have ginger and lemons just hanging out in the kitchen, too…and now I know how to use ’em. This lemonade is delicious, Jeff. The ginger adds another layer of flavor that really makes the drink pop. Oh, and Laura loves her diffuser. I saw your comment over the weekend, and I asked Laura what she thought about it now that she has had it in her office for a whole week. She said (and I quote): “Best decision ever.” So there ya go! OMG Robbie is getting sooo big and he’s crazy cute!!! It’s been so much fun watching him grow up, thank you so much for sharing so much with all of us. They young man has lots of love in his live. 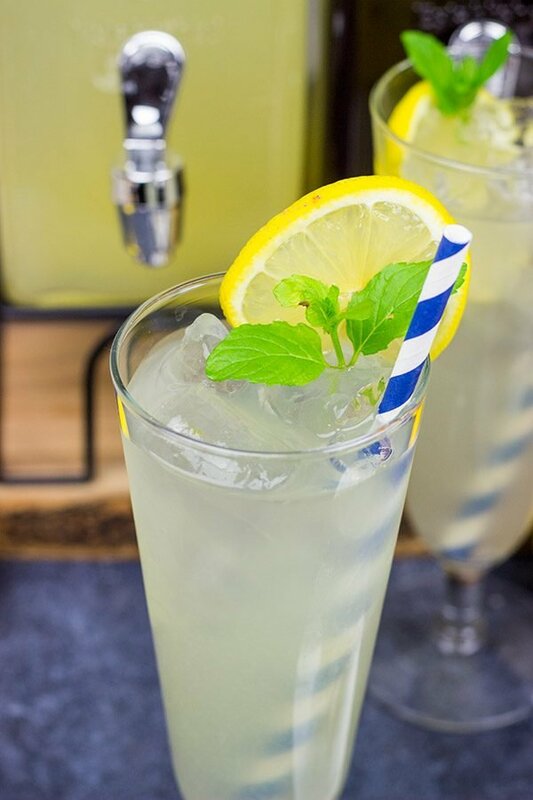 Your lemonade looks soooooo refreshing, perfect for spring. Tell me about it, Mary! I keep pulling Robbie’s clothes out to get him dressed…and they keep getting smaller and smaller on him! But that’s ok. We’re finally getting some spring weather up here, so it’s time to put away those winter clothes anyways. I really appreciate your kind words here, my friend. As you know, I often includes bits and pieces of real life in my posts…which means lots of a certain toddler. 🙂 He rode his bike for the first time yesterday, and he did a pretty decent job. And, yes, this ginger lemonade is so refreshing! The ginger adds just another little touch of intrigue to this classic drink. Thanks!! Thanks for the preview of summer, David! It’s seems a long way away right now. Like you our Spring is late arriving, although it looks like at long last we may be getting a taste this weekend… finally! 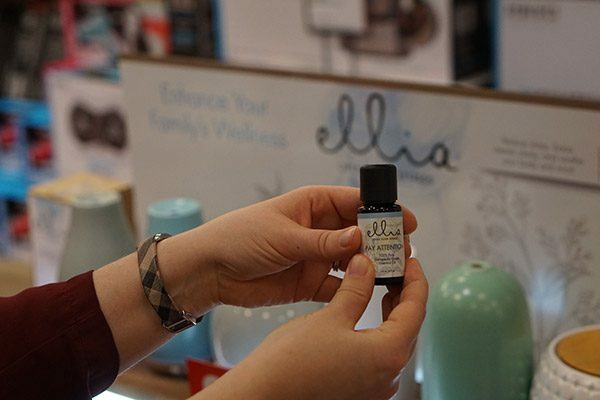 Good choice by Laura in getting an essential oil diffuser! I have one at my house and I put oils in it every night before bed. I want to start remembering to move it into my office (or get another one for my office for that matter) to use up more of my daytime oils that are meant for focus/energy/etc while I work. And fresh lemonade is so refreshing! Throwing some ginger in there sounds like a great idea. I was a little surprised when Laura mentioned that she wanted one of the oil diffusers, but then I thought about it and it made perfect sense. I mean work can be stressful, so having one of those at your desk is a pretty genius idea! Also, the ginger flavor in this lemonade is SO good. It’s perfect for warm afternoons in the sun…which we are finally getting up here in the northeast! Thanks, Nicole! Robbie is such a cutie and he is getting so big. 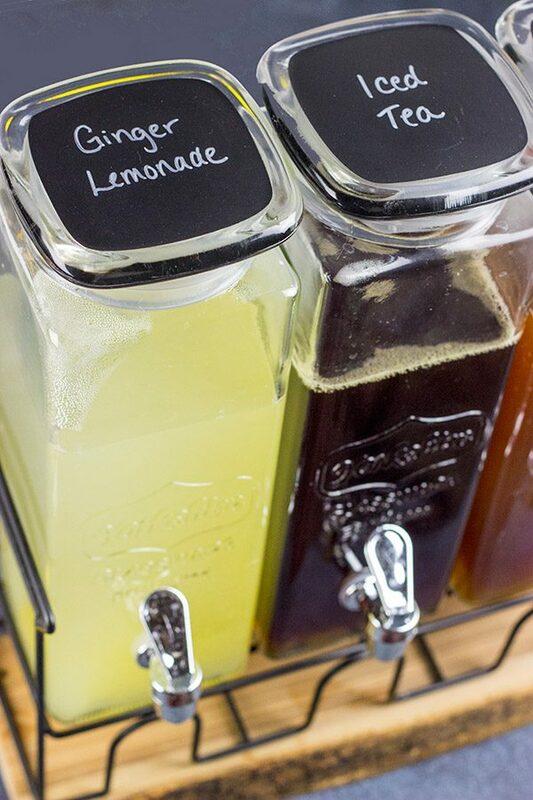 I love the ginger lemonade, sounds so refreshing for summer.